Those doing it well know that GREAT social media requires authenticity, creativity and real emotional connections; but on a mass scale! Not a small feat. Social media has and always will be about people - so it makes sense that businesses and marketers strive to create people-to-people connections rather then business-to-people commercial content streams. 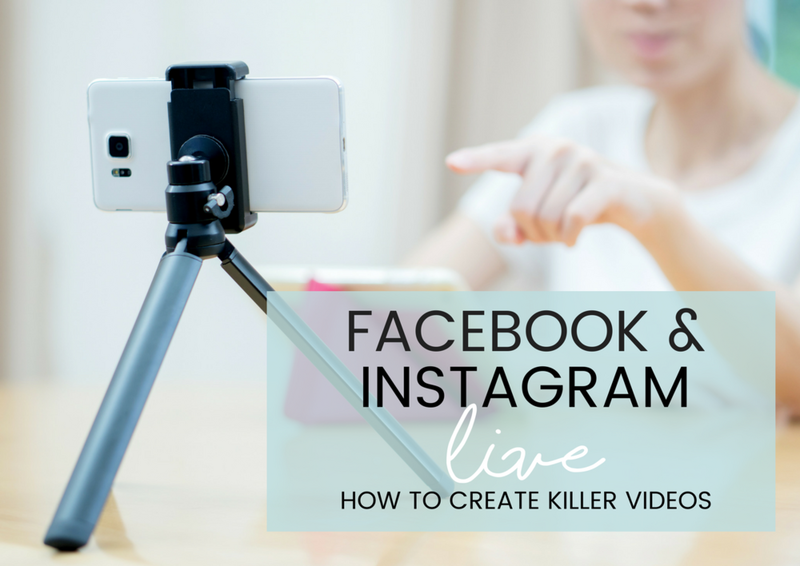 Facebook and Instagram LIVE video is a fantastic way of fostering these connections - you're putting human faces to the brand and engaging on an emotional level with fans and followers. Facebook and Instagram reward you for filming LIVE, with a percentage of your fans and followers receiving a notification that you are LIVE. This is a huge advantage over traditional posts to the feed and can receive between 6-10 x times the engagement of other posts. It makes sense to get good at them! But I know what you're thinking; I didn't sign up for this - I don't want my face on camera, I HATE hearing my own voice or I'm not a confident public speaker. We totally get it; the number of people in this world that are 100% confident in front of the lens is pretty small. All the more reason for you to get out of your comfort zone and start dominating this delightfully uncrowded space! Here's our tips to dominating LIVE video in your industry; connecting with more of your customers and selling more products and services. Is the topic something that customers often have questions about? Are you introducing a new concept, product or service that requires information and education? Do you have an event coming up that your customers would find interesting or useful to watch along with you? Would you like to increase engagement with the topic up to six times more than posts to the feed? If you answered yes to any of these questions, then a live video could be the answer. What to film? These content ideas are similar to what you might normally consider for stories, but they will be delivered in a longer, more in-depth format. To ensure as many people as possible are viewing your LIVE, make sure you pre-promote in advance; create some hype - post to the feed, include the details in your eDM's and also post to stories the day before. Here's where you might start to get the sweats. Take some deep breathes, calm down and remember that we're all human. You'll probably make some mistakes and that's ok. You'll get better with practice. Film your FB and Insta LIVE at the same time - If you're short on time - use your iPad for one and your phone for the other - or use a colleague's phone. Otherwise, just choose the platform where you have the most engaged audience and the platform where most of your customers hang out. Encourage people to comment and use reactions - Like/Love/Sad/Wow etc during the broadcast. Decide in advance how and when you will acknowledge your audience. When you do, address commenters by name and tell them how much you love their involvement. If you need to block a user that is commenting inappropriately, click on the profile picture next to their comment and select Block. Last but not least, try to relax and be yourself! As we are super passionate about all things social media, this post could have gone on for days! If you have any questions or if you would like us to cover something that we might not have mentioned, feel free to shoot us an email hello@socialmediacreative.com.au or please drop us a comment below. We hope that you picked up something in the post that you can implement today. For more tips, tricks and inspiration, be sure to follow us on Instagram here.